Need A Mini-Bus to Nottingham? 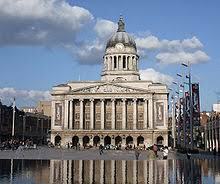 Nottingham is a place that you need to visit if you’re looking for a good night out. It isn’t too far from Manchester, so why not hire a Manchester Minibus and let Swinton Travel take you on your way to a fantastic stag or hen do. Theatre square is the place to be if you want to have a great night without having to walk the earth for it. All the clubs are situated closely together so there’s a minimal amount of stumbling needed in order to visit your next watering hole. Wether you have a stag or a hen to look out for, make sure they have a night to remember in one or many of the clubs that Nottingham has to offer: Halo, Flares, Jumping Jaks, Reflex, Gatecrasher, Oceana, Stealth, Rescue Rooms and many many more. Where Do I Go In Nottingham? The gay scene in Nottingham is just as good as Manchester’s, the area of Hockley is the place to visit for this and could be an amazing venue for your hen do. If you’re starting early, there are plenty of bars and pubs in the town centre that you can start in, the slug and lettuce and Murphy’s Bar to name just two. The canal side is where you need to be if you have real ale drinkers in your party, here you’ll find the only pub in England that has an integrated canal and moored barge inside, surely a must to see whilst enjoying a pint? Let ST minibus In Manchester take you to and from Nottingham with all of your mates so you can enjoy your “send off” in style. Relax in one of our luxury minibuses and enjoy the journey as our professional minibus drivers transport you to and from your night of fun.